The roots of the “tool watch” go back to the turn of the 20th century and was born out of wartime details of which are discussed and shared here. The genesis of the “tool watch” started when Rolex patented the Oyster watch case and winding crown in the late 1920’s. Even though Rolex was not looking to start a separate watch genre, the concept of a wrist watch that can withstand the elements was born out of designing reliable dress watches. In 1926, Rolex patented the Oyster case, winding crown, and crystal to have a hermetically sealed case that protected the movement from dust and water, two evils that were commonplace in mechanical watches at the time. Even though the case was water tight, watch wearers had to unscrew the crown to wind the watch. Rolex continued pursuing reliability by patenting and releasing the “Perpetual Automatic Rotary Winding Mechanism” in 1931 based on a 1770 design by Abraham Louis Perrelet. In addition to having a water-tight case, the mainspring is now consistently wound providing a full tank of power that improved watch’s accuracy. A full and consistent power reserve allows for consistent timing, which underlie Rolex’s records for accuracy throughout the 30’s, 40’s and 50’s. By 1934, Rolex was the first watch company to receive class certificates from all four of the main observatories (Kew, Geneva, Neuchatel, and Besancon). Rolex patents and advancements prior to the 1950’s were clearly to have the most mechanically reliable gentleman’s and ladies watch available. The notion of having a reliable timing tool strapped to one’s wrist did not take shape until the early 1950’s an era when Sir Edmund Hillary summated Everest and Auguste Piccard’s Bathyscaphe reached the depth of 10,335 feet underwater both proving the concept that watches can be as tough as the elements. Subsequently, in 1953, Rolex introduced the Turn-O-Graph with a rotating bezel – a tool watch design feature soon found in the Submariner and GMT Master in 1954. The Submariner and the GMT Master possessed the qualities that are the foundation of tool watches today. Both the Sub and GMT Master were released in 40mm, larger and heavier than watches of the day. These watches also possessed rotating bezels, large luminescent indices and hands on a black matte face for night reading, and crown guards –all details that puts these watches in the “tool” watch category. The introduction of the Submariner and GMT, and later the Milgauss, Daytona and SeaDweller started a whole new genre of “tool watch” developed in parallel with dress watches. 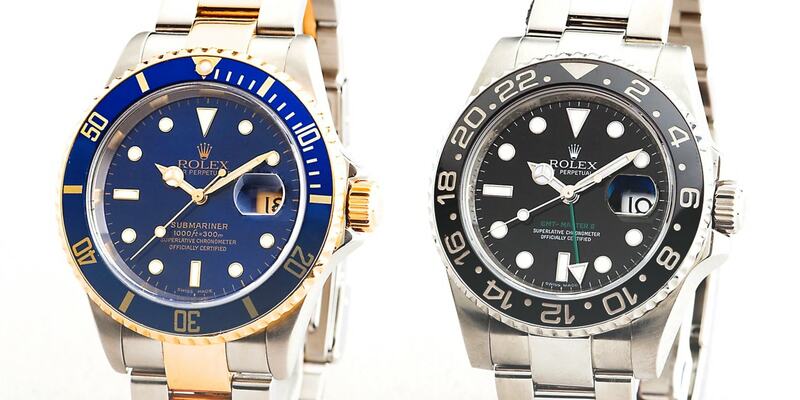 Rolex tool watches are now mainstays in the Rolex watch line, and the Submariner and Daytona are the two most copied watches in the world.